Washington's Netflix pick might surprise, but Oregon's is pretty predictable. While Netflix and other streaming service providers, like Amazon Prime, don’t release ratings information, curious investigators at HighSpeedInternet.com — which seeks to inform consumers about internet options — got to wondering who binge-watched what and where. 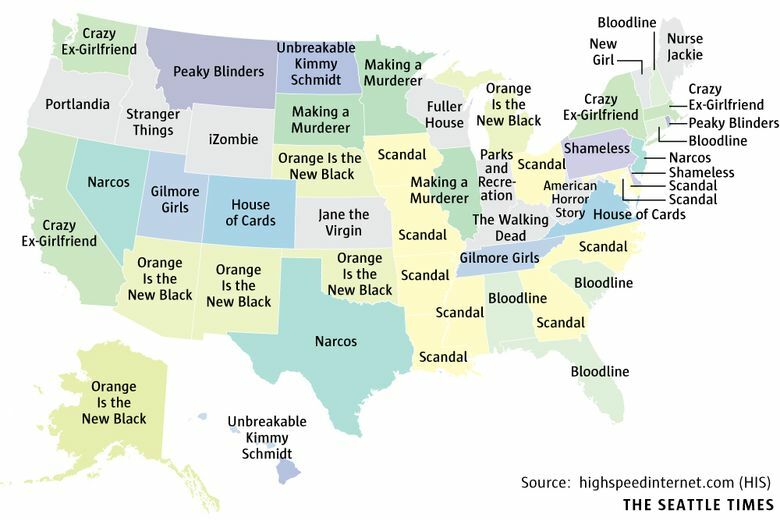 “We wondered if the data on streaming content by state in 2016 might tell a compelling story about how Netflix favorites reflect regional differences,” said the company in a blog post when the map was released earlier this month. The data was compiled, the company said, by cross referencing Netflix’s top 75 shows with Google Trends to determine which series was most likely to be streamed on devices in each state. “Scandal,” about political intrigue in the White House, proved popular across the South and the Midwest. “Orange Is the New Black,” “Bloodline” and “Narcos” are among the shows that made repeat appearances.